Nestled just below the majestic San Gabriel Mountains in the beautiful city of Arcadia, the Sathya Sai Center of Arcadia meets every Thursday evening from 7:30 to 9:00 p.m. Started over 24 years ago, the Center has now grown and has a regular attendance of between 60 to 100 members. A lively study circle is conducted from 7:30 to 8:00 p.m. each Thursday. Occasionally, the Arcadia Center will have a special guest speaker who will speak about their experiences with Baba or about His teachings. More regularly, when there is no guest speaker, 8:00 to 9:00 p.m. is the time to sing bhajans and then close with prayers and Arathi. Due to the different ethnic backgrounds of the devotees, we are fortunate to have songs sung in many languages such as Sanskrit, English, Japanese and Spanish. 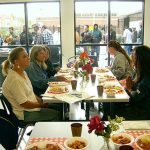 Devotees at the Arcadia Center also regularly take part in several service projects. 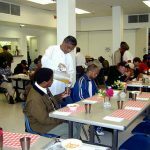 Most notably among them is the weekly convalescent home project where a group of devotees visit with senior patients at a convalescent home in their rooms, giving them a sense that a family member has come to visit them. A game of bingo is also offered which some of the residents take immense delight in. This is probably the longest running continuous service project at the Center and has been going on for over 20 years. 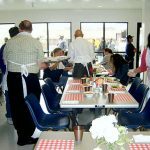 The Arcadia Center is also actively involved in other service activities such as collecting used eye glasses, collecting and distributing food through the Food Bank in conjunction with the Glendale Center, participating in medical camps. Each summer, we join the Young Adults as they work with children and youth from Ability First who have various disabilities to a fun filled day at the beach. 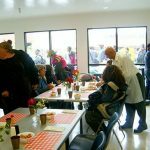 Some of the Arcadia Center members also make sandwiches for the homeless. Others lovingly pass the sandwiches and other food items out to the homeless on Sundays in downtown Los Angeles. From time to time, conjointly with the Glendale Center, the Arcadia Center participates in making personal hygiene bags to hand out to the homeless of Los Angeles. The Arcadia Center conducts special programs on certain spiritual holidays such as Maha Shivaratri, Buddha Poornima, Guru Poornima, Krishna Janmashtami, Ram Navami, Ganesha Chaturthi, and Christmas. Being located in a highly residential area, at the end of the evening’s worship, the devotees are asked to depart from the Arcadia Center quickly and quietly. This is so as to not disrupt the neighbors, and also it allows us to follow Baba’s instruction to us to conserve the highly concentrated spiritual energy invoked during the devotional program. The members of the Arcadia Center wish to extend their warmest welcome to all newcomers. We hope that you will visit our Center and, if you are a member of the local community, we hope that you will regularly come and join with us as we worship the Divinity within all beings. 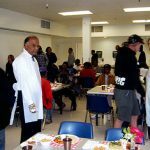 Every year on the 6th day of May, the Sri Sathya Sai Baba Center of Arcadia serves a hot meal to the homeless and the needy at the Pasadena Union Station Homeless shelter. This is a date that all participants, including the administrative staff and the homeless, eagerly cherish and awaits its arrival. 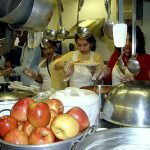 They know that on May 6th, they are treated with the highest quality home cooked hot Indian meal of the year, by some disciplined people who will treat them with respect, love and compassion.